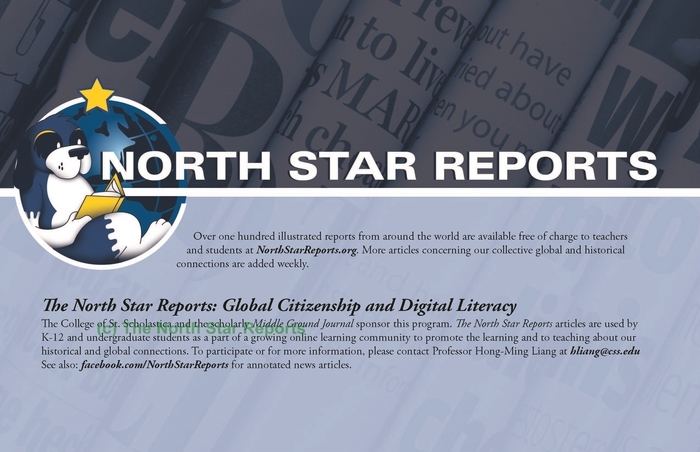 Professor Hong-Ming Liang, 梁弘明教授 Ph.D., Founder, Editor-in-Chief, and Publisher, The North Star Reports: Global Citizenship and Digital Literacy ; Chief Editor, The Middle Ground Journal: World History and Global Studies . Kathryn Marquis Hirsch, Managing Editor, History, Russian, Class of 2014. J.D., University of Minnesota Law School, Class of 2018. Ellie Swanson, Assistant Managing Editor, English, Class of 2009. MA, Education. Wrenshall School District, MN. Please submit all articles to Professor Liang at HLIANG(at)CSS.EDU — submit articles as MS Word files, the photos should be as .jpg files — you must verify that you own the rights to the photos. 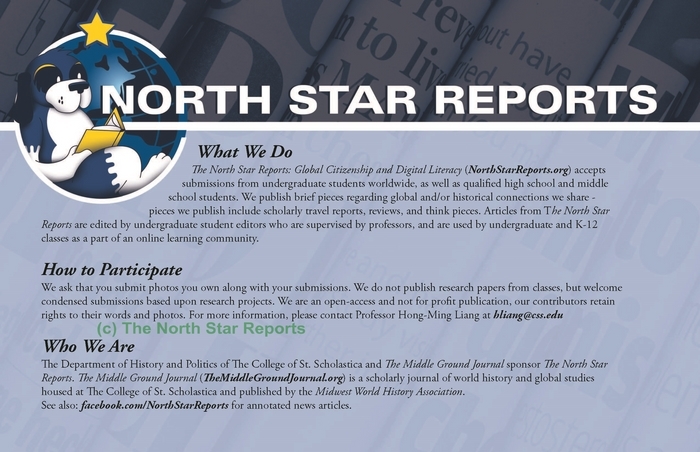 The North Star Reports: Global Citizenship and Digital Literacy (http://NorthStarReports.org) is a student edited and student authored open access publication centered around the themes of global and historical connections. Our abiding philosophy is that those of us who are fortunate enough to receive an education and to travel our planet are ethically bound to share our knowledge with those who cannot afford to do so. Therefore, creating virtual and actual communities of learning between college and K-12 classes are integral to our mission. In five semesters we have published 200 articles covering all habitable continents and a variety of topics ranging from history and politics, food and popular culture, to global inequities to complex identities. These articles are read by K-12 and college students. 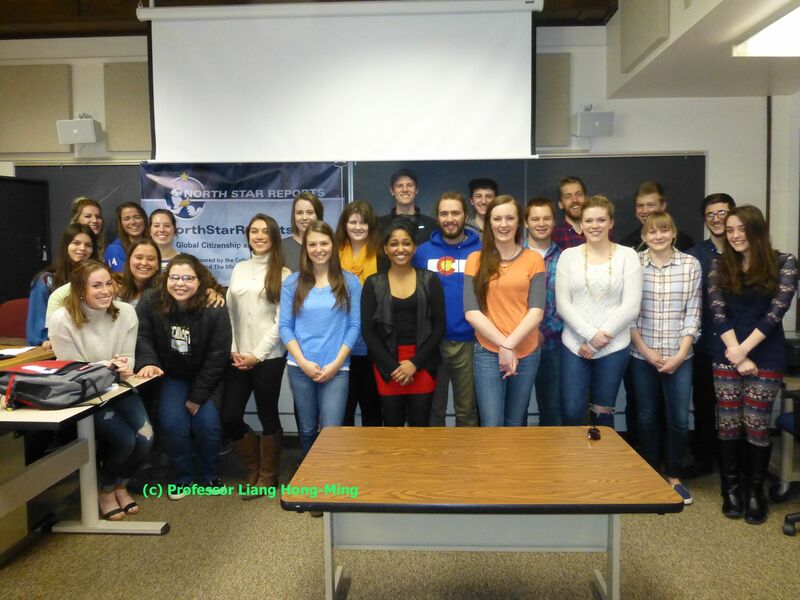 Our student editors and writers come from all parts of the campus, from Nursing to Biology, Physical Therapy to Business, and remarkably, many of our student editors and writers have long graduated from college. 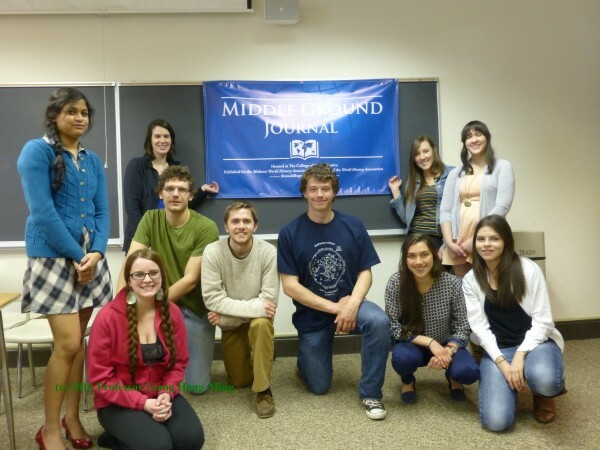 We also have writers and editors from other colleges and universities. 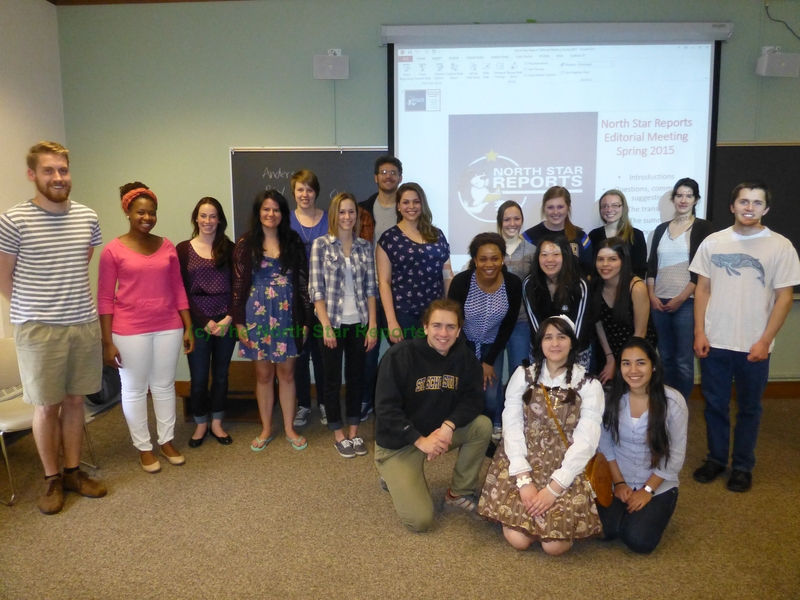 In addition to our main site, we also curate a Facebook page dedicated to annotated news articles selected by our student editors (http://www.facebook.com/NorthStarReports). This is done by an all volunteer staff. 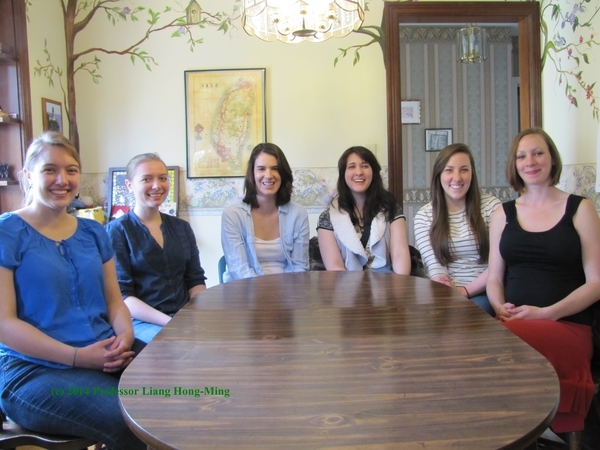 We have a frugal cash budget, and we donate much of our time and talent to this project. 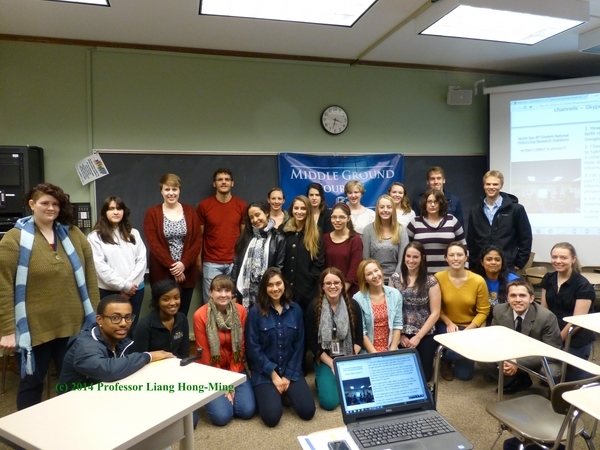 The NSR is sponsored and published by Professor Hong-Ming Liang, NSR Student Editors and Writers. Professor Hong-Ming Liang, Ph.D., Editor-in-Chief and Publisher, The North Star Reports; Chief Editor, The Middle Ground Journal. Contributors are solely responsible for the opinions, analyses, and conclusions of their essays. The editors disclaim any responsibility for the opinions and analyses of the contributors and those who submit comments. The North Star Reports grants open-access to all not-for-profit and educational institutions, provided that 1) the piece(s) are reproduced and/or linked in their entirety, without editing or alterations, 2) full and written/printed credit is given to The North Star Reports and to the author(s), and 3) that such a reproduction is not for a fee of any kind. Teachers and students are warmly invited and encouraged to use this journal in their classes. We encourage you to please let the Chief Editor know when you reproduce our work on an open-access basis. 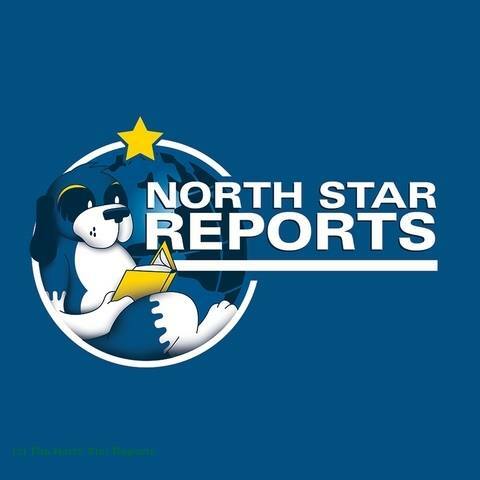 If you wish to link to anything in The North Star Reports, please inform the Editor-in-Chief and Publisher. Each issue is copyrighted as a periodical. 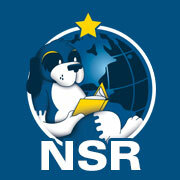 Individual authors retain the rights to their own works; by submitting their work to NSR they grant permission to The North Star Reports to include said works as part of the contracted issue of the journal, and as part of a permanently archived electronic database. Please include your full name and institutional affiliation when you comment. The North Star Reports reserves the right to refuse to post comments for any reason. We have made every effort to educate our student writers on the importance of respecting intellectual property rights. If one of our student writers has mistakenly submitted an image that is not open sourced, please email the Editor-in-Chief and we will remove the image(s) immediately.